In the ancient world, religious rituals were multisensory experiences, filled with vibrantly colored representations of supernatural beings, resonant musical sounds, billowing clouds of incense, and the taste of food and drink. Sights and Sounds of Ancient Ritual considers the ways in which these rituals appealed to the senses through objects that would have drawn worshippers into closer proximity to divine forces. 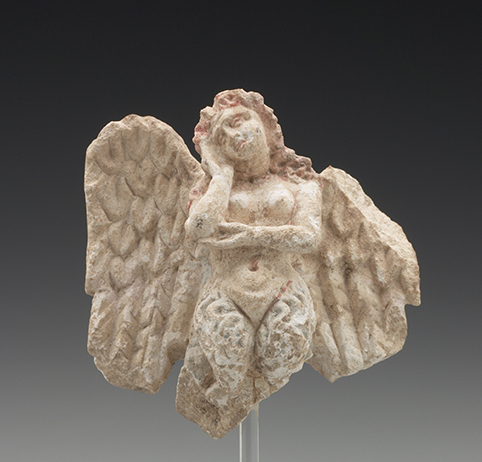 The exhibition brings together more than 80 works from the Yale University Art Gallery and the Yale Babylonian Collection at the Yale Peabody Museum of Natural History that span three millennia—from approximately 1500 B.C.E. to 1500 C.E.—and represent diverse traditions, including those of ancient Greece and Rome, Western Europe, Egypt, West Africa, the Near East, China, and Mesoamerica. The works on view depict gods and goddesses, illustrate aspects of religious ritual, or had ritual functions themselves, ultimately showing how ancient cultures used visually and sonically evocative objects to create powerful connections with the sacred. Sights and Sounds opens with a musical instrument known as a sistrum, a small yet powerful object that sets the stage for the exhibition. Made in ancient Egypt, the sistrum was used as a rattle during rituals for the goddess Hathor, who often assumed the guise of a cow and is shown here with bovine ears. The head of the goddess is surmounted by a temple-like doorway, an imposing post-and-lintel structure pierced by metal rods that hold small pieces of metal, which would have clacked together when the instrument was moved. 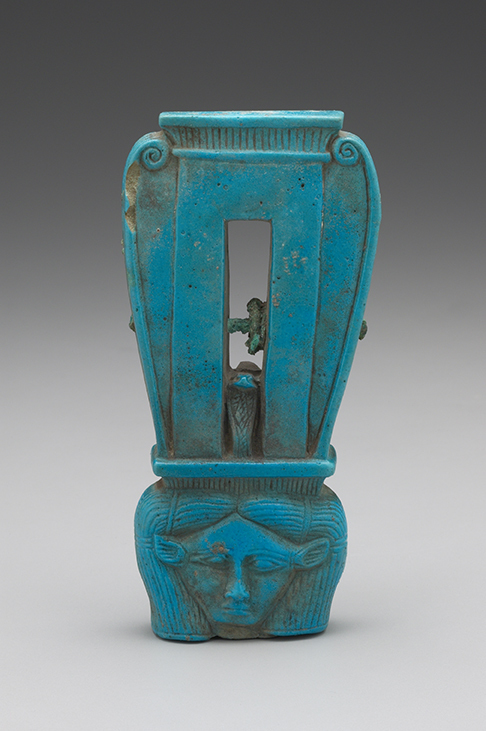 The two faces of Hathor, which look out on either side of the instrument, represent her omnipotence as a solar deity. The rituals celebrated the return of the goddess, and the sound of the rattling sistrum was intended to evoke the rustling of the rushes and grasses under her feet as she walked toward her temple. The vivid blue color and brilliant surface of the object are the result of its manufacture in faience, which carried connotations of the immortal gods and was meant to recall the shimmering light of the sun. One section of the exhibition, curated by Daphne Martin, mc ’19 and the Betsy and Frank H. Goodyear, Jr., b.a. 1966, Intern, delves deeper into the use of faience and blue pigments to explore the manufacturing process and the importance the color held in various ancient traditions. This section also highlights conservation research conducted at Yale’s Institute for the Preservation of Cultural Heritage by presenting digital reconstructions of the original pigmentation of two sculptures in the exhibition from Egypt and ancient Greece. 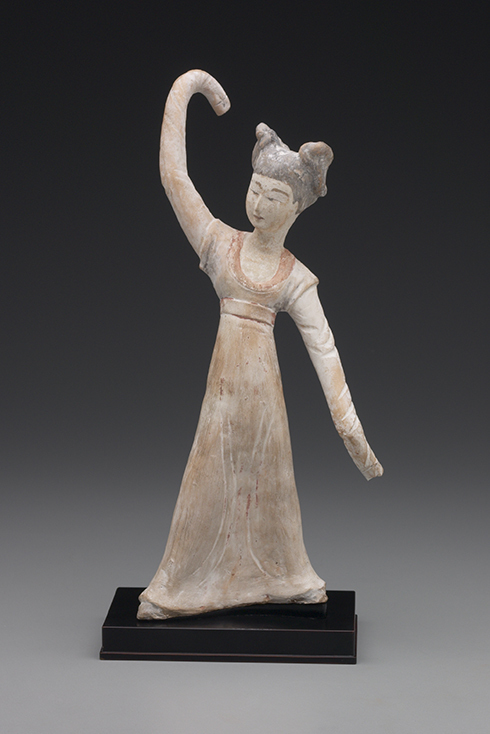 earthenware tomb figures of young dancing girls are juxtaposed with an ancient Greek figure from southern Italy of a mourning siren, a mythological creature that was thought to sing lamentations for the dead. Visitors can experience the sounds of the ancient world during a rich array of programs offered during the run of the exhibition, including a performance by U.K.-based artists Barnaby Brown and Stef Conner on February 7, 2019. Conner sings compositions inspired by ancient texts and melodies, and Brown performs them using reconstructions of a variety of ancient instruments, including the aulos, a Greek double-reed instrument similar to an oboe. Susan B. Matheson, the Molly and Walter Bareiss Curator of Ancient Art, comments, “Sights and Sounds of Ancient Ritual beautifully illustrates the encyclopedic range of the Gallery’s collection and brings together University collections to create an even more compelling experience for museum visitors.” The exhibition forms part of a multidisciplinary, yearlong project sponsored by Archaia: Yale Program for the Study of Ancient and Premodern Cultures and Societies that explores the relationship between the senses and ancient ritual. For more information on the project, including the related spring graduate seminar, “Sensory Experiences in Ancient Ritual,” visit archaia.yale.edu.